I thought it might be interesting to see if I could find something about a New Year's Day of years ago. I found an interesting post from 1835 that shared a little of the author's opinion of the direction of the president and country as well as a few details of the day. The author was Philip Hone who had served as New York City's mayor in 1826-1827. The new year commences auspiciously so far as the weather is concerned. There has never been a finer New Year’s Day; the air is clear and pleasant, and just cool enough to preserve the snow, which gives facility to the visiting part of the population. I went out in the sleigh at twelve o’clock, and visited until four, leaving several of my visits unpaid, which delinquency my wife and I made up in the evening. Broadway, from morning until night, and in the night too, was crowded with pedestrians, and the music of sleigh-bells was heard without the least intermission. Smiling faces were seen on all sides, and all the cares and troubles of 1834 appear to have been forgotten in the joyful anticipations of 1835. The year which has commenced seems destined to be an eventful one, at home and abroad. The administration of General Jackson and the continuance of his popularity will test the strength of our political institutions. If the people continue to support him in his most unwarrantable assumption of power, it will be idle to talk about the republican principles on which the government is founded. But among other difficulties which he has to encounter during the coming year is that of the quarrel with France, in which his unnecessary threats have involved us. The king is disposed to do us justice; but the Chamber of Deputies, composed of men who like bullying themselves, will not submit to the bullying of others, and I fear that our government has been committed by the President too far to admit of any peaceable compromise. The wisdom of Congress may save us, and it certainly would, if party-spirit had not more influence than a regard for the true interest of the country. But to the Senate we may yet look for patriotism and public virtue, and there we rest our cause. Source: Tuckerman, Bayard, ed. The Diary of Philip Hone, 1828-1851. New York: Dodd, Mead, 1889. Vol. 1, p. 125. For those who have already read the post for the upcoming Carnival, you'll be happy to know that I hit 10,000 records for FamilySearchIndexing today! I'm transcribing the 1850 Bullitt County, Kentucky census right now trying to reach 10,000 before tomorrow night. I decided it might be attainable if I worked on it enough. I found an interesting household. The household is that of Nathan Harris. It's a pretty typical farm household in most aspects. The reason I found it interesting is that Nathan (age 29) has a son Smith in his household. Now that's a name that you just don't see that often as a first name, but my gg-grandfather Walton A. Harris (b. 1812 in KY) also named one of his sons' Smith Harris. I have little reason geographically to believe that Nathan could be one of Walton's unidentified brothers, but I will eventually pursue it just to check it out just because of the son's name. The other thing that is interesting about the household is that one of the two "boarders" (I'm calling them that since relationships are not stated in the 1850 census and the surname is different) has a rather interesting occupation. It is "learning English." Theodore Castelman, age 22, was born in France. It's a shame that many of today's immigrants no longer feel the need to learn the language of the country in which they are residing. I am not a fan of New Year's Resolutions. Most of them are broken in the first week or so. I do sometimes set goals, but I learned a long time ago that my genealogy goals are long-term rather than short-term, and I've had so many unexpected obstacles that I'm even hesitant to make anything a one-year goal. What did I accomplish last year? I uncovered Agnes Thornton's maiden name. That had been a dead-end for awhile. I've also found a marriage location for Richard Thornton to Agnes through this. I have a "date" the marriage is said to have occurred; however, I still need a better source for this date. I'm not stupid enough to think I'll find that source in one year when it took several years to find Agnes' maiden name! This family liked to burn courthouses to cover up their history (or at least it seems that way). I indexed over 9000 10,000 records for FamilySearchIndexing.org. I'd hoped to do at least 10,000, but family health issues and the busyness of the holidays has kept me from doing as much the last couple of months as I'd wanted to do. I reached this "goal" on December 31. I've made some progress in entering a backlog of previous research into my database; however, I keep adding to the pile! LOL Actually, I'm doing pretty good at keeping up with information on the lines I'm trying to focus on (my New England maternal lines); however, I have information collected on lines which are not my current research focus (primarily the Thornton line) that have some "backlog" building up. I actually accumulated a lot of the research myself because of contact with some of the lines with whom my brother's DNA matched. Most of what I collected was research in the county in which I work because a line that had lived in that county matched. Some of it was accumulated by a cousin who lives closer to where one of these lines settled. I'm less concerned with getting the North Carolina line that matched into the database because the individual who researched it was a historian who documented what he did and he sent me his self-published book on his research. It's not that I'm not interested in researching these lines -- I've just got to prepare for my New England trip, and getting those lines in the best shape possible will help me be more focused and productive when I get there. I've made significant progress on many of my New England lines. This has largely been because of Google Books. I take what I find and search for more or note resources that I need to examine when I go to New England. This brings me to my biggest genealogical plan for 2008. I have a library conference in Boston in June. It is my intention to go to Boston one week early and stay an extra day and a half (or maybe even two days) so that I'm in the area for at least two weeks. During the extra days, I want to do research at NEHGS and other repositories and visit some of the places my ancestors lived. I'd also like to do a few touristy things. I know that I don't have time to visit all the places my ancestors lived. (I plan to save Block Island for a separate trip.) I really want to make at least a day trip to Hampton, New Hampshire. I'd also like to go to the present town of Essex, Massachusetts which used to be Ipswich's Chebacco Parish. I've got several other places I want to be a tourist, some of which also figure into my family's heritage. I haven't worked out all my weekends yet. One of the reasons is because I know that the conference will be organizing some pre-conference and post-conference tours. If some of my destinations are on their list, I may go with a group of my friends instead of doing it alone. I'm not going to plan any further than that because I know I'll be preparing for a couple of future conferences which may consume some of my normal research time; however, I know that I'll sneak some research in! I always manage somehow. This article is submitted for the 39th Carnival of Genealogy hosted by Jasia at Creative Gene. Update (12/31): I thought of one more thing I researched last year. A new index to was available which allowed me to know some of the names in some of the probate files at the Monroe County, Mississippi Chancery Clerk's office. I spotted my elusive "W. D. Phillips" on some of the records. I was hoping that some of them would give me some insight into his father. What I discovered, however, after copying a rather huge file was that the file that would have given me the greatest insight into his identity was not him but another W.D. who apparently also lived in the area. The files pertaining to the estate of John E. Fowlkes were, of course, the correct W.D. because he is mentioned as the husband of John E.'s daughter Mary Elizabeth. My W.D. is William David Phillips. The W.D. in chancery case 3195 is William Dennis and was married to a P.J. and is younger than my W.D. There is also a David (or D.M.) Phillips in the county who appears in the Harmony Church records and appears to have married a Sallie from the tombstones in the Hatley Cemetery. There are two Sarah Phillips mentioned in the Harmony Church records. There is a female M.E. Phillips in the Harmony Church records who could be my Mary Elizabeth Fowlkes Phillips. I need to go to Jackson and get his Civil War file to see if it yields any clue to his identity. He just kind of "appears" in Monroe County in the 1860 Monroe County census residing in the household of his future father-in-law. I've seen him in records as late as 1866 or 1867 - and then he kind of disappears. I can't find him, Mary Elizabeth or daughter Jennie (aka Lucinda Virginia) in the 1870 census unless they are the W.H. and Mary listed as a couple without any children mentioned. (In the 1880 census, there is a W.H. the same age who is married to a Martha, slightly older.) Since Jennie was born in 1865, you wonder where she is if that is them. Jennie is enumerated in the George Tubb household in 1880. I've been following the weather forecast for New Year's Day here for a few days. They are calling for snow. They've actually "upped" our chance today, so I'm hoping for some of the white stuff. After 14 years of writing "Along These Lines . . .," George G. Morgan is throwing in the towel. I have referred many people to the advice offered in his columns over the years. His is a voice that will be missed in the genealogical blogosphere. Check out the 174th Carnival of the Recipes on the subject of "Memories." Knitting: A deadly hobby? Check out "Sock Wars." [This video is free.] The free preview of the full article is here. You must either have a subscription or purchase one to view the full article. Okay - this isn't a blog post . . . it's an article in the New York Times. This house looks like a real haunted house. It's in the Bronx. The house was built in 1896. I sure wish someone had done a more complete house history, but what little is there is interesting. Also in the New York Times: Rhode Island, "A Colony with a Conscience." The op-ed was written by a Columbia history professor. The Night After Christmas sounds like a very good children's picture book. The premiere issue of Code4Lib Journal has an article about a project analyzing the demographics of Pullman, Illinois over a forty year period. The article is entitled "Connecting the Real to the Representational: Historical Demographic Data in the Town of Pullman, 1880-1940." It's really interesting to see how the database was put together. Analog TV and rabbit-ears are to be a thing of the past in less than 14 months. I invite everyone to share their favorite "rabbit-ear" memory here or share the link if you blog it! The Boston Public Library is also interested in scanning local Boston and Massachusetts documents and is in the process of creating its own digital archive. Today I was entering some information into my genealogy database regarding my Perkins family in Essex County, Massachusetts. The source for the information came from Records and Files of the Quarterly Courts of Essex County Massachusetts; volume IV, 1667-1671. Salem, Mass. : Essex Institute, 1914. I found what appears to be a feud between the Perkins and Brabrooke families. In the September 1668 minutes, there was the case of "Richard Brabrooke v. Abraham Perkins. Trespass upon a replevin. Verdict for defendant. Court did not accept the verdict." It sounds to me like a family feud. I suspect that those on both sides of this dispute would have never imagined that a little over 100 years later that members on both sides of the feud would marry one another. A descendant makes sure her grandfather's memory lives on by publishing a book he wrote. I know it's after Christmas, but this story I just found is worth sharing. The story was apparently first published in 1976 and has even been the subject of an animated film. Washington state: Save the school librarian. Carson-Newman Choir: On the way back to the States from Bethlehem. From 1895 to 1958: Eggnog. A tale of two Christmases. It's an article from the New York Times in 1958. Another steroid scandal. You'll have to click to see who the users are. A look at some historic housing in New York. Some interesting stories here. Santa's diary entry for last night. Roaming charges, "lying" songs, and OnStar all play a part. Update: I just noticed that this was my 600th post! if genealogical software programs can handle ten marriages per individual? Everyone ought to read today's Mass Moments post about celebrating Christmas (or the lack thereof) in the state of Massachusetts. You'll learn a little about how our ancestors did or did not celebrate the holiday. How did you and your family spend Christmas Eve? There's not really a special way we used to spend Christmas Eve. When I was little, I remember that the weather man used to always let us know on television when he spotted Santa leaving the North Pole. Of course, as radar became the norm on local TV weather, they utilized that as well. Of course, I'd set out a plate of cookies and milk for Santa. Then I'd go to bed early. In my teen years, I remember assembling all my nephew's toys on Christmas Eve. Nowadays, I usually sneak out my parents' gifts on Christmas Eve after they've gone to bed. Our church did not have a Christmas Eve service when I was growing up. My parents' church has one now. We went a couple of years, but it ended up being the same program year after year and was nothing special, so we haven't gone the last couple of years. My plans for this year include watching old movies like White Christmas and the Bells of St. Mary's. I watched Holiday Inn this afternoon. I'll watch either the Lemon Drop Kid or The Bishop's Wife this evening. The other one is game for Christmas Eve or Christmas Day until all five classic movies I brought with me are viewed. This is the final post in this year's Advent Calendar of Christmas Memories. Do you have a special memory of a first Christmas present from a sweetheart? How did you spend your first Christmas together? I call my cat my sweetheart. He traveled with me from Cincinnati to Amory on our first Christmas together. He was still adjusting to traveling at the time and probably cried for about the first three hours or so. He didn't know my parents or their house, and it took him awhile to get used to them. He hid under the couch and under my parents' bed when my brothers and their families visited. I had him a little stocking (hung on the mantel) that was filled with catnip and some toys. It was fun to watch him stretch up to get to the stocking. What Christmas is complete without a few good Christmas reads? I'm sure all of us had a copy of A Visit from St. Nicholas (or Twas the Night Before Christmas) by Clement C. Moore that we read each year at our homes. I'm not sure whatever happened to the copy that I had while growing up, and I wish I knew who the illustrator was so that I could obtain another copy. Then, we all know the story of Ebenezer Scrooge that Charles Dickens brought to us in A Christmas Carol. Even if you never read the book, you've seen a movie adaptation or play. Kate Douglas Wiggin brought us another Christmas classic in The Birds' Christmas Carol. O. Henry brought us The Gift of the Magi. I'm currently reading Murder Most Merry, a short-story collection that features a lot of well-known mystery writers. I've also decided that I must not have tagged all my Christmas books as "Christmas" because there are a few picture books that I know I have that aren't in the listing. I just can't remember all the titles right now. I have one that is the neatest little picture book that shows how Christmas is celebrated in different cultures around the world. This is the grab bag post for the Advent Calendar of Christmas Memories. WAY TO GO TEAM CINCINNATI! I'm so proud of the Cincinnati choir! I really can't believe they actually won over Patti LaBelle's choir, but I'm so happy that Children's Hospital is getting that 1/4 million dollars! Did your family visit the cemetery at Christmas? How did your family honor deceased family members at Christmas? I can honestly say that I don't think we visited the cemetery at Christmas until I started genealogical research. Now, I usually visit cemeteries on my Christmas break. Why? Because the snakes are hibernating! It's the best time to visit them. I don't think we had a special way of honoring family members although it was always sad on the first Christmas without someone we were used to have being around. What songs did your family listen to during Christmas? Did you ever go caroling? Did you have a favorite song? We had a few Christmas albums at the house growing up. I know one of them had Gene Autry singing Rudolph the Red-Nosed Reindeer. Another had a version of "I Saw Momma Kissing Santa Claus". I think there was one of hymns, and a Perry Como Christmas album. Some of my favorite Christmas songs were the ones I heard when I was in the Tupelo Mall. Songs like "The Christmas Song," "Winter Wonderland," and "Let It Snow." I have quite the collection of Christmas albums now too. Some of my favorites are Bing Crosby's White Christmas, The Carpenters' Christmas album (I am away from my collection at the moment and can't check the titles), Mannheim Steamroller's Christmas album (the original one - I haven't heard their new one yet although I did hear a cut from it on the radio today), Kenny G's Christmas album, Amy Grant's Christmas Album (the first one that had "Tennessee Christmas," "Heirlooms," and "Emmanuel" on it), and the Talleys' Christmas album from about 1989 - give or take a couple of years. As far as favorite songs, as far as religious ones, I would have to say my two favorites are on Greater Vision's Christmas album. Both feature Gerald Wolfe, their lead singer. The two cuts are "Cherish That Name" and "O Holy Night." As far as secular, I have to go with Amy Grant's "Tennessee Christmas" as far as more recent ones. I love a lot of the classic songs too. I think it's hard to pick a favorite Christmas song, because I love most of them. Caroling? Our youth group used to go. I was going to go in the park this year in Morristown, but I wasn't well enough yet to go. It sounded like fun. For today's Advent Calendar of Christmas Memories, we discussed shopping. Something that goes hand in hand with shopping is advertising. We've all watched commercials on television. We've been getting some unusual ones on our local television lately. When we first started getting Macy's commercials airing quite regularly, I grew very hopeful that they had somehow managed to put a store in our area without my hearing about it. However, when I went to their web site to search for locations near here, I came up blank. I began to try other large cities in the area. As nearly as I can tell, the two closest Macy's locations are in Greenville, South Carolina and Lexington, Kentucky -- both a little over 3 hours away. Next would be Nashville, Tennessee, Atlanta, Georgia, and Charlotte, North Carolina -- the former being about 3.5 hours away (although the store is probably a full 4 hours away) and the latter two being about 4 hours away. I just find it unusual that Macy's (which I would dearly love to come into our area because Belk has terrible buyers and has very little competition) would advertise as heavily as they have when it's three hours to the nearest store. [Dillard's is the only other national competition for them.] I might be able to see doing such a thing out west where towns are further apart and people regularly drive long distances to shop; however, they don't have stores in Knoxville, the tri-cities area (Johnson City, Kingsport, Bristol), or Asheville. It just seems a little odd that they are making me want to drive such a long distance to discover the "magic of Macy's." I wish they'd just put a store in either the new Dumplin Creek development that is under construction at exit 407 in Kodak (which is the main exit for Sevierville, Pigeon Forge, and Gatlinburg) or at Turkey Creek (which is further but would still be better than driving to Lexington or Greenville). * The traditional song "Swing Low, Sweet Chariot" refers to "a band of angels coming after me." She calls us a "choir." Scholastic, publisher of children's and young adult books, has a warehouse over by the Knoxville airport. They are having a warehouse sale that runs for a few more days. As a librarian, I was able to pre-register so that I could get a quick pass and get right to shopping and so that it would be easy to check out. I also got a coupon for $10 off a $50 purchase. Let's just say that with prices as low as they are at the warehouse sale that it's a lot harder to hit $50 than you might think. Most books are 50% off the cover price. There are a handful that are only 30% off. There are some books that are up to 80% off. I'm a firm believer that children's books are for all ages. I took advantage of the sale to purchase several books of interest. A few of those were purchased because of my genealogy and history passion. I thought I'd share a few of those titles with you all. Rinaldi, Ann. A Break with Charity: A Story About the Salem Witch Trials. New York: Scholastic, 2005. [orig. pub. 1992] - It's a story about Susanna who is involved in a meeting of girls at the home of Ann Putnam who, according to the cover (and as we know to be true from the history of the trials) "is about to set off a torrent of false accusations leading to the imprisonment and execution of countless innocent people." I spotted my 8th great grand-aunt's name in the book, so you know I had to purchase it! Bunting, Eve. One Candle. Illustrated by K. Wendy Popp. New York: Joanna Kotler Books, 2002. - While I'm not Jewish, this looked like a wonderful story about how Hannukah was celebrated by one family while living in a concentration camp. Cooney, Caroline B. Burning Up. New York: Laurel Leaf Books, 2001. [orig. pub. 1999] - Here's the line from the back cover that sold me on the book: "But when Macey decides to research the history of a burned-out barn across the street from her grandparents' home for a school report, she gets a shock." That sounded pretty close to land and property research that we genealogists love! Greene, Rhonda Gowler. The Very First Thanksgiving Day. Paintings by Susan Gaber. New York: Scholastic, 2003. [orig. pub. 2002] - Who can resist a picture book about the Pilgrims, the Mayflower, and the Indians? Duble, Kathleen Benner. The Sacrifice. New York: Aladdin Paperbacks, 2007. [orig. pub. 2005] - This is another 1692 Salem book. The setting is the nearby town of Andover where accusers are coming to "identify witches." The back cover indicates that the author does a good job explaining the hysteria that is sweeping through that part of Massachusetts. It appears to be written for a younger audience than Rinaldi's book. So - starting and ending with Salem - I've given you a glimpse of a few of the day's purchases. How did your family handle Christmas Shopping? Did anyone finish early or did anyone start on Christmas Eve? I know of no one in our family that ever waited until December 24 to start shopping. I don't know when they shopped for me although I occasionally found evidence around the house in a "hiding place" or two that Santa had made an early delivery. We did a lot of the shopping for my brothers and their families in Tupelo. Mom tended to be one of those persons who thought everyone needed clothes for Christmas. By the time I was buying gifts, I made sure that my nephews and later my nieces had something besides clothes among their gifts. Before Amory had a Wal-Mart, we usually went to Fred's or to what was my favorite dollar store in town, V. J. Elmore's. This particular dollar store had a certain "smell" to it. They also had some loose wooden boards in the floor in the toy section. I think I just enjoyed the experience of being in that dollar store and looking through the little bins at all the toys they had. I think we had a store called Hi-Lo there for awhile, but I wasn't very fond of it. There was also a Sterling's Dollar Store that went into the Glendale Shopping Center by what was then the A & P. For clothes shopping in Amory, I remember visiting Black's. There was also the Dorothy Mae shoppe. I think that was what it was called back then. Another store in town that usually had better clothes was the Casulaire, but we rarely purchased clothes there. Their markup was probably 20% over what you'd pay for the same thing in Tupelo at Reed's. If we shopped for Dad, we'd usually start at Anthony's Men's Shop in Amory, but we sometimes ended up at McCullough Long McCullough in Tupelo or at Reed's. Mom would always have a few ingredients for Christmas foods that she'd have to pick up at McCullen's Grocery Store. They were the only store in town that had some of the specialty ingredients. They used to take orders from people and deliver them also. When the first mall came to Tupelo, we thought we'd hit the big time. It was anchored by Sears on one end and by Brett's on the other. I don't remember all the shops that were in it, but it was a lot of fun to shop in the mall. Later, a second mall came to Tupelo. They had a Woolco on one end and J.C. Penney on the other. I don't remember which mall had Kress, but it was like a super-size dollar store, if I remember correctly. Both malls would figure into our Christmas shopping. When I went to college, I began shopping in Memphis for Christmas. There was a lot of variety there. I will never forget my first year living in Cincinnati (the first of two times). I was in graduate school, and my roommate and I went downtown where we hit the bargain basements of L.S. Ayres and Shillito's. We also went through the main stores and through some of the indoor malls downtown. Our arms were full, but we did almost all of our shopping in one blitz. After the downtown shopping was not as good, I tended to do a lot of shopping at Kenwood Towne Center. Tri-County Mall or some of the buildings on the outskirts of it is where I'd usually finish it up in the evenings after my major blitz. Here in East Tennessee, the Tanger Five Oaks Mall in Sevierville is my favorite place to Christmas shop. If they are out of something, I can usually get them to call the Pigeon Forge store (usually in either the Red Roof mall, the Belz mall, or the other Tanger shopping center). I, of course, have a few places that I always want to visit around Christmas time whether or not I buy anything. One of those is One More Stitch which is the cross stitch shop here in Morristown. One is Cracker Barrel's store. They have great ornaments for gifts. Another is the Robert A. Tino gallery in Sevierville. He's a wonderful local artist. I really like to catch the open house sale where you can get 8 x 10 framed prints for $25. Some of the frames are really cool, however, his artwork is exceptional. Le Gourmet Chef in the Five Oaks Mall is one of my favorite shops. I bought Wusthof knives there one year for Mom and for me. I also like some of the gourmet food items they have. I can always get Cafe du Monde beignet mix there. They have some of the Barefoot Contessa's products there as well. Of course, taking a break during shopping to enjoy Starbuck's or Ben and Jerry's is part of the shopping experience! The 38th Carnival of Genealogy is posted over at Creative Gene. The theme of this issue was the New Millennium. Bloggers were challenged to share how they celebrated Y2K. The theme for the next edition is New Year's Resolutions, specifically research-related ones. I never make New Year's Resolutions; however, I may share some research goals. The deadline for submissions will be January 1. If I Had Irish Ancestry . . . I would join the Irish Genealogical Society International so that I could be a regular recipient of their quarterly journal called The Septs. Browsing through the table of contents of the various years, it is apparent that they have articles that would be helpful to those researching their Irish roots as well as articles on general resources of interest to most researchers. I actually became aware of this organization and their publication because I was asked to write an article which will be appearing in the January 2008 issue. The article is based on one of the sessions I presented at the 2006 FGS conference in Boston. I did rework the presentation and try to keep my audience in mind for the forthcoming article. This is submitted for the January 1 edition of the Carnival of Irish Heritage & Culture which will be hosted at Small-Leaved Shamrock. Deadline for entries is December 28. How cool is this? The guy who is currently leading on Jeopardy was just quizzed by Alex because he spent a lot of time in cemeteries. I knew immediately he was a genealogist. He said his ancestors were mostly in western New York graves. I hope this guy (Kevin) wins today! Yes. It was made by my Aunt Daisy for me before my first Christmas. She had stitched my name on the white "cuff". It was a soft felt-like material. It had a green ribbon string. Where did you hang it? It hung on the doorknob of the living room most of the years. We didn't have a mantel or a fireplace when I was smaller. What did you get in it? Mostly fruit and nuts. However, there would also be chapstick, jewelry, or other small items at times. Miriam, over at AnceStories, is challenging us to tell future generations where we are hiding in the censuses. I'm not telling my specific age, but I'll just say that I was in Amory, Mississippi through the 1980 census. By 1990, I was in Cincinnati, Ohio. By 2000, I was in Morristown, Tennessee, where you'll be pleased to know that I received a long census form to fill out. Did your family attend religious services during the Christmas season? What were the customs and traditions involved? I grew up in the Bible Belt. We went to church every time the doors were open, so yes, we attended any services held during the Christmas season. However, we did not have Christmas Eve services at our church unless it happened to fall on Sunday night or Wednesday night while I was growing up. About the only tradition at the church in which I grew up was the children's Christmas pageant. Once in a blue moon, we might put together a cantata, but it was rare. As a musically-inclined person, I wish we had done more musicals or cantatas, but realistically, I know that the talent just wasn't in our church to pull one off. In fact, it was not until I moved to Cincinnati in the mid-1980s that I even knew what an advent wreath was. I guess the church in which I grew up considered that too Catholic or something. All, or maybe I should say most, of the Protestant churches in the Cincinnati area observed Advent. I was told it was because there were so many Catholics in the Cincinnati area that there were many former Catholics in all the churches to which this custom was very special. Now that I'm back in the South, I have to admit that I do sometimes miss the way Advent was celebrated in that area. When I was in Cincinnati, one of the other "new" traditions for me was a "Chrismon" tree. This was a tree that we'd decorate each year with symbols that had to do with Jesus. I remember cross-stitching Alpha and Omega (the Greek Letters) one year for it. All the symbols were in gold and white. There was a special Sunday evening service where the tree was decorated. We have a Chrismon tree at my church in Tennessee, but I'm not sure who decorates it. It just usually appears by the first of December. As an adult, I've always been a part of the music program at whatever my home church was at the time. I participate as a choir member in the musical we are doing that year. I've already mentioned The Living Christmas Tree. That is what we do at the church where I'm a member now. It combines a musical and drama, and I sing tenor. [I came down with a cold this year right before the Living Christmas Tree. Our music minister saw me on the night of the first performance after I'd been out for both dress rehearsals and asked how I was. I opened my mouth and started talking. He said, "Oh, my, you're a bass." He asked last night if I was better. I told him that I might be up to baritone. He laughed.] Tonight is the last performance for this year. I believe that they will place it online, and if that is the case, I'll post a link when it is available. I just haven't been able to find the picture from a few years back that I used to have. Next Sunday, I'll be singing at my Mom and Dad's church. I will probably sing "Cherish That Name" and "O Holy Night." What did you do to celebrate Christmas at school? Were you ever in a Christmas Pageant? I really don't remember very much about Christmas celebrations at school. I believe we had parties in the lower elementary grades right before we let out. We sang a few Christmas songs in music class. By the time I was in middle school, I was in the band so we were part of the Amory bands Christmas program each year. In high school, we had all the area Christmas parades in which we marched. (I played piccolo in marching band.) It was terribly cold at times because in order to be able to move my fingers on the keys, I had to cut out the finger-tips of the gloves. However, we never had to do this. I don't think the schools ever had Christmas pageants. Those were left to churches in the area, and yes, I was always in the pageant. I was usually the main angel because that one had the biggest part to memorize, and I had those lines "down pat." Nowadays, Christmas in the world of higher education usually means food. We bring food for parties for various groups. We have a catered meal for all of us faculty members. We sometimes have white elephant exchanges. We exchange small gifts--usually either baked goods, candies, ornaments, or similar items. I take the college girls who work in my department out to the Designer Moments Tea Parlor for a little more elegant lunch than they would get in the college cafeteria. Most of all Christmas means that a much-needed break is coming! We need time to recover from the fall semester before beginning the spring one. Tonight is the first of three performances for this year's Living Christmas Tree presentation. This year's theme is "A 1940's Christmas Homecoming." We are using music from two other books as well. The handbells will be ringing as people enter. We (the choir) will begin the evening in our formal attire on the stage where we'll sing a few selections. Then, as the choir leaves to get ready to climb the tree, Jane Greene Johnson who used to sing with the Speer Family will sing on Friday night and Saturday night and Gerald Wolfe who is the lead singer with Greater Vision will sing on Sunday night. The choir will load the 11-tiered tree. The artificial greenery can be kind of prickly at times. There is just barely enough room for a person to fit between the front and back of each row. I understand that we have more room than a lot of churches have in theirs, but I'd sure hate to be in a tighter space than the space we have. Those who are under 6 feet tall stand on taped-up cardboard blocks that will adjust our height so that we are about 6 feet. We wear metallic capes that make us look like ornaments in the tree. This year we are wearing the gold ones. (We have some silver ones which I like better but are more prickly to wear.) There will be a drama that accompanies the music. The harmonies are very tight, as you would expect in 1940s music. The entire presentation takes an hour and a half at most. We begin working on the music in late August or early September. There are numerous bonus rehearsals. It's a lot of work, but it's a lot of fun. Our presentation is televised locally. DVDs are usually available later. There are over 2000 bulbs on the tree. I thought I had a picture of the tree from a previous year, but I can't seem to locate it. If I find it, I'll upload it later. I remember all the preparations for the millennium. As the person responsible for all the computers used by staff members as well as two computer labs in the library, it was my job to make sure all the computers had the required patches installed. Of course, I had student workers do most of the work, but I did go through and double-check everything and did all the staff machines myself. We also had to think about the various software packages we used and make sure they were going to be able to handle the new millennium. I was never one of those persons who worried too much about what was going to happen. I never really anticipated major glitches that couldn't be resolved with a work-around. I believe that I was still at my Mom and Dad's house on New Year's Eve. I remember watching the millennium being rung in all around the world as the night wore on. There were no major glitches. I knew I'd been right not to worry about Y2K. I stayed up as usual until the new year had begun, but I did not stay up much longer than that. I may have had some sparkling grape juice on hand. It really was not that different than any other New Year. If it had not been for the sender box on the label bearing the name of a neighbor, I would have thought one of you had decided that it was time for me to have the experience of re-gifting a fruitcake. Well, thanks to my neighbor, I'll now have that experience. The UPS man came with a box containing one. I kept hoping as I saw the round tin (knowing the place it had been purchased) that it was Moose Munch or nuts. As far as fruitcakes go, it should be a pretty good one since it came from Harry & David's. My choir section is supposed to take chips and dip to the choir party tonight. I haven't come up with a dip to make from a fruitcake. If I sliced it very thin, I could fry the pieces, but I don't think they'd be very good chips. That leaves me with the option of re-gifting it. So . . . who will be the (un)lucky recipient? Did you like fruitcake? Did your family receive fruitcakes? Have you ever re-gifted fruitcake? Have you ever devised creative uses for fruitcake? Fruitcake: the original gift that keeps on giving. I don't have a lot of use for fruitcakes. I think that Kirk Talley in his "Fruitcake" (recorded on his Talley Ho, Ho, Ho album in the late 1990s) gave some of the best potential uses for fruitcakes when he suggested using them as doorstops or paperweights. I haven't checked to see if the song is available for download on iTunes, but you can purchase it via Kirk's store or get the song itself at Walmart.com for 88 cents. Trust me; the song is worth the 88 cents. I won't tell you what he eventually does with the fruitcake, but he's got some other creative uses in the song. One of the salesmen who called on Mom at the hospital gave her a fruitcake one year for Christmas. Mom was working one night when we needed to take some sort of dessert for a Christmas event at the church. Dad called Mom to see if we could take her fruitcake to which she readily agreed. It was one of those fruitcakes that was in a narrow rectangular gold box. One of the men in the church asked Dad to get him "another glass of that fruitcake." Apparently, it was well-soaked. I think that's the last time we ever took fruitcake to church. I've been fortunate that I've never received a fruitcake that I've had to regift. I would, however, give it to someone who eats fruitcake if I did receive one. I can eat a few bites of fruitcake if I'm in a social situation where it would be rude not to do so, but it is far from being my favorite Christmas food, and I could never make it through a whole one. footnoteMaven has challenged us all to go blog caroling. They carol I've chosen is a hymn that has been a favorite over the years. The song was originally written in Latin and entitled "Adeste Fideles" by its author John Francis Wade (1711-1786). Wade made his living copying manuscripts. He was reportedly an excellent artistic calligrapher. This hymn was in a manuscript he copied in 1750 which was sent to a college in Lisbon, Portugal. The song was translated into English by Frederick Oakeley (1802-1880). Source of background information: Brown, Robert K. and Norton, Mark R., eds., and comps. The One Year Great Songs of Faith. Devotions written by William I. Petersen and Randy Petersen. Carol Stream, Ill.: Tyndale House, 2005. Did your family attend any special events or performances during the holidays? Amory, Mississippi was not exactly the arts capital of America. We, of course, had the usual Christmas pageants at church, but ours was very simplistic and followed the same format every year. When I was in band, we had Christmas concerts every year. I really don't remember attending anything more extravagant than those two events growing up. As an adult, I've directed children's musicals and such and participated in cantatas at previous churches and in the Living Christmas Tree at our church (which by the way is coming up this weekend). In fact, I'm missing the dress rehearsal as I type this because I have been trying to come up with a way to ebb the flow of my nose since yesterday. I'm really proud of my children's choir, and the way they performed for last Sunday night's program! They did a great job. Did your family ever volunteer with a charity such as a soup kitchen, homeless or battered women’s shelter during the holidays? Were you able to make the holidays special for someone less fortunate? I've shared previously (in the ornament post) about helping out at Operation Christmas Child. Our Sunday School class always adopts at least one family at Christmas, and I've purchased things for them. I've helped at soup kitchens as part of church groups before, but there is one Christmas where our family helped a family in need that really stands out. One year Mom had a new employee in her department at the hospital. Mom knew that this person was having trouble making ends meet and that her children were not going to have a very good Christmas. She sent Dad and I out shopping for toys and gifts for the children because she wanted the children to have something that Christmas. I remember picking out dolls for the girls, but I know we got some other toy for each of them too. I think we got a Tonka truck or something similar for the boy and probably something else as well. I had been doing genealogy for several years, when I made an email contact with a lady doing research on our Harris line. As we began to talk, this newfound cousin was the mother of those kids we helped out. She turned out to be Mom's second cousin twice removed or my third cousin once removed. She was able to share with us how grateful she had been at that point in her life for our generosity that Christmas, and we got caught up on where life had taken her after she moved away. Did you travel anywhere for Christmas? How did you travel and who traveled with you? Do you remember any special trips? Growing up, I rarely had to travel anywhere. I was much younger than my brothers so they were the ones who got to travel to come home to my parents' house. I really don't remember travelling anywhere for Christmas. I have a vague recollection of going to my brother Jim's house one year because I seem to remember eating the Virginia ham that he always had and putting together some of his kid's toys. However, it was like most other Christmases. Of course, I've travelled most of my adult life to my parents' house for Christmas. There was one memorable trip. I was living in Cincinnati, and I didn't get off until around noon on Christmas eve. I always took a half-day on Christmas eve though so that I didn't have to travel late into the night. On that particular December 23, I was closely monitoring the holiday weather as I worked. When I got home that evening and saw where the storm was and where it was headed, I saw that if I waited until morning that I was not going to make it home for Christmas. I packed my bags and Brumley's things, took a quick nap, loaded the car, and left at 7 p.m. Eastern and drove overnight to Mississippi. It snowed on me the last hour and a half of my drive. Shortly after I got to Mom's the power went out there. As I watched the news the next morning, I noticed that there was severe icing and interstates closed along the route that I had driven the night before so I knew I'd made the right decision to get out of town while I could even if I did run short on sleep. There were still bad power outages all over north Mississippi that next morning, and we thought one of my brothers was going to have to bring some of the stuff from his freezer down to Mom's so it wouldn't spoil. I think his power came on before it got too critical, but it was out for a long time by usual standards. I always think of that as the Christmas I almost didn't make it home for Christmas. Yes, we did have a White Christmas that year--something very unusual for Mississippians. What were your favorite gifts, both to receive and to give? I think that this has changed over time. When I was a little girl, I always looked forward to my Christmas doll. Later, it would have probably been board games. Now, I love handmade gifts or gift cards to Amazon.com, Borders, Barnes & Noble, BooksAMillion, and/or Starbucks. You get the picture? I would love to be able to cross-stitch a lot of my gifts, but I don't have the time. I like to make food goodies. I give a lot of ornaments as gifts, particularly to colleagues at work. (This year I also gave them to my children's choir.) I give subscriptions to Southern Living to several family members. Mom used to provide them, and I picked them up after she decided not to do them. I also give a lot of gift cards, especially to people who live at a distance and don't make it home. It's easier to send a gift card than to pay a fortune to mail a package. Brumley is happy as long as he has catnip and some of the little shiny craft pompoms to bat around. I love trying to find something special for him, but you know how cats are. They just don't get excited about anything for which you want them to get excited. I bought him a "bird" last year. It was a bluebird that looked a lot like the ones in the yard, and it even made the bird's call. I got it at the Bass Pro Shop. He occasionally plays with it, but not often. No parties for us. The closest thing to a party was the family getting together. One year we had a lot of us there. The neighbor came over to take a photo of the entire family. (The picture shows 14, but I think that I had some aunts and uncles there too.) We stood at the end of the living room where the piano was. We heard a “crack” in the floor, and the men went investigating and discovered there was a termite problem. "This is the "picture that broke the floor." After I looked at the picture, I don't think this picture was made at Christmas, but probably in late summer. Notice the light clothing! Also the "baby" in this photo was born in mid-June so a late summer date is probably more likely. It's strange how we remember certain things happening at times of the year when they did not. I do remember Christmas parties back in elementary school. I don’t really remember what we did back then, but I remember it was on the last afternoon before we got out for break. Of course, I’ve attended many parties as adults. I’ve got at least four to attend this year. Visit the Advent Calendar of Christmas Memories at Destination: Austin Family for more entries! Did your family make Christmas Cookies? How did you help? Did you have a favorite cookie? These aren't cookies, but I made these decadent brownies last night and took them to a party tonight. I substituted the peppermint extract in the batter because I got the regular Oreos. I used Ghiridelli chocolate. The only thing that could possibly improve upon them is to add a scoop of Blue Bell Homemade Vanilla ice cream to the top while they are still warm. This recipe is definitely staying in my collection. Cat survives after having a peanut butter jar stuck on its head 19 days. One of the most memorable Christmases of recent history was Christmas 2001. Here is Brumley under the tree. That's Mom's Annalee Santa Claus off to the side. Brumley's big gift of 2001 was this cat spa. He never used it quite like it was supposed to be used and liked it better at first than he did later. I've got it in storage now. We played Dirty Santa. Jim ended up with the "Wild Thing." Here is Katelyn dancing along with the animal playing the song. I think we all made Jim give up the "Wild Thing" and give it to Katelyn after we got so much enjoyment from her dance! Right before Christmas, I had the opportunity to go meet some cousins who gave me my great-great grandmother's dress. I'm a little too big for it, but my Mom fit in my dad's grandmother's dress. Dad says that "Grandma Jennie" always wore this black dress. I think this is one of the best Christmas presents ever! Grandma Jennie (Lucinda Virginia Phillips Fowlkes Howell) died in 1943. Did you ever send a letter to Santa? I always sent letters to Santa which were usually published in the Amory Advertiser. This was before the days when all the classes in school wrote letters and they were organized by the class so parents could easily locate the letters. Sometimes we'd have to search through the entire letter section to find my letter. I usually visited Santa in the Tupelo Mall. My “list” was always in my letter. I’m dating myself when I remember that the big anchor store in the mall (besides Sears) was Brett’s or Britt’s. (I can’t remember the vowel now.) As we would walk up and down the mall, they’d be playing Christmas songs. I think they had "Winter Wonderland" in a high rotation on their playlist because I remember it was always played a lot in the mall, and it wasn't on any of the records Mom and Dad had at home. I never got my picture made with Santa though. Be sure to visit Thomas at Destination: Austin Family for more Santa memories in the December 6 Advent Calendar of Christmas Memories. Did people in your neighborhood decorate with lights? Did some people really go “all out” when decorating? Most people in our neighborhood decorated with some lights, but not to the extent that you see in today’s displays. Some would put spotlights on the doors where wreaths might be hanging and on a few doors the door might be covered with wrapping paper. Some might have lights on the shrubbery or a very fake looking reindeer, but when I was small, you rarely saw the lights hanging all the way around the house or elaborate yard displays. Most people had their tree in the window and driving around town to look at the Christmas lights often meant you were just looking to see who had the best-lighted tree. Other neighborhoods had better lights than ours. After Mom and Dad moved from my childhood home, their neighborhood used luminaries to light the curvy streets for a few years. As the neighborhood aged, that tradition ended. I only have one shrub, and I don't see any sense in putting lights in one outdoor bush. My lighted tree has to suffice for the lights! I do have a wreath for the door. I have not invested in outdoor spotlights for it yet. To be honest, I haven't had time to think about getting a spotlight until now and Lowe's is closed at the moment. Last year, I had just purchased a home so that additional expense wasn't in my budget. I am not going to get on a ladder to hang lights around the trim of the house. I've seen some cool lighted figures that I wouldn't mind purchasing at some point, but I don't have time to shop for them so I'll live without them this year. Thanks to the Library of Congress Blog for linking to this Reuters story of the Map that Named America. On an unrelated topic, LibraryThing just got better. Jasia has posted the 37th Carnival of Genealogy. I figured that I might as well dream big since I won't get my wish anyway. I'm single, and Santa always seems to expect me to pay for what he brings me. It's a shame that I can't get the cat that owns me to go out and get a job. Did your family send them? Mom always sent Christmas cards, mostly to relatives, but a few were sent to people she'd met on camping trips or longtime friends. After I got old enough, I'd send some to a few of my pen pals who were mostly people I'd met in church camp or occasionally on a camping trip. Did your family display the ones they received? One year, I made something in school that we used to display the cards. As I recall, we took one of those tall Hi-C cans or grapefruit juice cans and cut out both ends with the can opener. Then we wrapped yarn all the way around it and through the middle so that you had a lot of places for cards. As we received cards, we put them on the can! We used that for years! I have a card holder from the Hallmark store that I use now. Mom just piles hers on the table or microwave at her house. Yes, I still send cards. I also create a letter to put in each card so that those with whom I only correspond once a year can catch up! I always hope that the ones I receive will have a note or letter in them too! I wish more people would send cards nowadays. It's nice to hear from people at least once a year. Somehow a real letter (even if it is just a form letter) and a real Christmas card seem more personal than an email and definitely more personal than an e-card. Now . . . I just have to find the time to get them addressed. I knew I should have done it before Thanksgiving, but with all the illness in my family, I just didn't find the time. Now I've got a lot of student work to grade and a lot of other commitments, so my cards might not get sent until the semester ends. I just hope I get caught up sooner! See The Advent Calendar hosted by Thomas at Destination: Austin Family for more bloggers musings on Christmas cards (and other Christmas subjects). The one day I didn't have my camera . . . I saw five deer crossing the road on the way to work. They were all doe. (Go ahead, sing it . . . "Doe, a deer, a female deer . . .") It was less than a mile from my house. I live near Panther Creek State Park, and I suspect these were from there. The fifth deer appeared to have a leg injury, but I stopped and waited for her to get across the road as the other looked back. Totally unrelated, I'm so glad that Dawn has finished the Britty Kitty stocking for Allie. I have a soft spot for cats, and Brittercup makes some of the best designs out there for cat lovers. They are quick to stitch too which makes it even better in my book! I need to look in my stash and see if I have the pattern. If not, I need to run to One More Stitch and get it. If it's not in stock, I can order it for next year. If it were 20 degrees colder . . .
we might be getting quite a bit of snow. It's raining fairly hard right now outside. However, I did want to share the snowball fight story over at Boston 1775 with my readers. It involves Harvard Yard and some soldiers. Did your family have any traditional dishes for the holidays? Was there one dish that you thought was unusual? Turkey and dressing and ham were usually on the menu. Pies were usually pecan and chocolate. Mom always made candies, especially fudge. While we are on the subject of fudge, I should tell a story. On one of Mom and Dad's trips after they retired, they found some wonderful cranberry fudge somewhere on the coast of Oregon. For several years, Mom would always order a box from them at Christmas. Later, the place went out of business, but she found out about another place nearby which supposedly had that place's recipe. Let's just say that the box of fudge was rather disappointing. Mom then proceeded the next year to devise her own cranberry fudge recipe. She got that recipe tweaked, and it's a family favorite now. I dare not share that recipe with you all though without asking Mom's permission. Mom always made an “Amalgamation Cake” at Christmas. This was a very popular cake in northeast Mississippi as you can see by a recent mention at Itawamba History Review and Terry's description of it in today's Hill Country of Monroe County Mississippi . When I was little, I thought it was awful. Later on, I developed a taste for it. It's very rich. If you are watching your cholesterol, don’t even bother to look at the recipe! Cream together sugar and butter. Sift together baking powder and flour and gradually add to sugar, butter. Add milk as needed while mixing. Add vanilla. Fold in egg whites last. Divide mixture into two 9 x 13 inch pans. Bake in a 350 degree oven until inserted toothpick comes clean. Combine sugar, butter, egg yolks, and coconut water (or milk). Add remaining ingredients. Mix well and frost. Did your family have heirloom or cherished ornaments? Did you ever string popcorn and cranberries? Did your family make ornaments? I think the cherished ornaments were the homemade ones that I made in kindergarten. We mostly had glass balls. There were some that had some sort of sunburst in them that were kind of different. I only remember one time we tried the popcorn stringing. We didn’t make ornaments for the tree on a regular basis, but every now and then there was one.Today, I collect Christmas tree ornaments for places I visit. I’ve also got a few that either mom or I have made from craft type things. I’ve got ornaments that have been given to me that make me remember the person who gave them to me as I hang them. I'll try to share a bit about the ornaments in the collage. First row, first ornament - Yellowstone National Park. I got this on my first visit to Wyoming. My brother had been transferred with Wal-Mart to Sheridan. We decided to go to Yellowstone and Grand Teton National Parks while we were out there. My parents had driven from Mississippi, but I flew from Cincinnati, where I was then living into Billings, Montana where my brother met me at the airport. First row, second ornament - Operation Christmas Child. Most folks are familiar with their shoebox program at Christmas. Last year I had the opportunity to go over to Boone to help get the boxes ready for distribution. They gave all volunteers this ornament as a means of thanking us. We worked a two or three hour shift, and I believe we were all exhausted at the end of the time. It's a little late to prepare a shoebox for this year, but I hope all of you will consider putting together a shoebox for next year. First row, third ornament - Cincinnati Reds, 1990. This ornament commemorated their sweep of the Oakland A's in the World Series. This was when I was living in Cincinnati. I remember really celebrating that win. I had one of those craft brooms on my door with a bunch of cut-out A's under the straw. First row, fourth ornament - My best friend who knows how much I love the Vols gave me this Smokey ornament. Second row, first ornament - This is from today's Ladies Brunch at church. It's my newest ornament. Second row, second ornament - Wall Drug - If you've never been to this South Dakota landmark, it's worth the trip for the glass of free ice water. Second row, third ornament - This ornament with a sled was given to me by some special friends who live in Virginia. Third row, first ornament - Roy Rogers-Dale Evans museum in Branson. I got this one the year the Association of Christian Librarians Conference was in Springfield, Missouri. A few of us snuck down to Branson during a break in the conference. Third row, second ornament - This is actually a left-over from some ornaments that I gave to other people one year. I believe I purchased it at Cracker Barrel. Third row, third ornament - This angel was given to me by a colleague in Cincinnati. It's a beautiful angel. Third row, fourth ornament - This is an ornament made with beads and fishing line that I made last year. I've got lots more beads and fishing line and plan to make more if I ever have the time. We made this at the story time that the student organization I sponsor at work hosted. Fourth row, first ornament - This is the bottom part of an ornament that my Mom purchased for me on one of their big post-retirement trips. I believe she got it in Oregon. 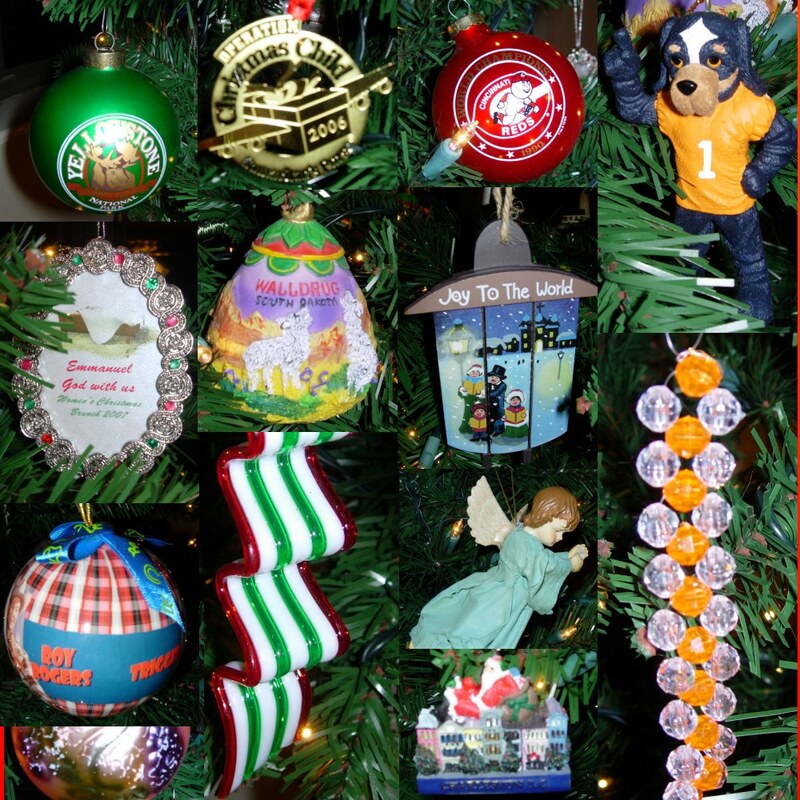 Fourth row, second ornament (in third column) - This is an ornament I purchased in Charleston, South Carolina. It depicts Rainbow Row. There are lots more, but I thought I'd just share a few! I thought Randy might appreciate the following ornament from the San Diego Zoo. I got it on a visit in 2000. Did you have a real tree or was it artificial? When I was young, we had a real tree. Later, when mom’s allergies were worse, we had an artificial one. I have an artificial one now, but I toy with the idea of a real one. I just have such a busy holiday schedule, though, that the thought of caring for a real one is almost overwhelming. In fact, I just replaced my tree with one that has the prestrung lights. How big was the tree? The real trees were probably 6 or 7 feet tall. It's been so long that I honestly don't remember and can only estimate by the photos. The artificial one we had the longest was probably 4 to 5 feet tall. Later we had a 6 foot one. My present tree is about 6.5 feet tall. The entire family (or at least the women and children) decorated the tree. My brother's family and I usually decorate my parents' tree at Thanksgiving. With the death of my uncle during that holiday this year, our schedule got a bit off, so my sister-in-law was going back to Mom's this weekend to get the family tree up. Brumley tries to help me decorate ours. He enjoys batting at the ornaments on the lower limbs. It's time for another edition of my somewhat irregular blog roundup. The inspiration for today's roundup was not a genealogy blog at all. Instead, it is because I'm absolutely drooling over these decadent-looking goodies over at Baking Bites. I've got to make a finger food for a party next week, and I may have to bake a batch. If they don't work out, I can always go to plan B. I suspect they'll turn out perfectly though so I won't have to go to any backup plan. I'm a little jealous of where Randy is spending his weekend. The town sounds charming. I don't have use for the casino, but I'd take the snow if they have it. I always love a good B & B.
Dear Myrtle accidentally looked in Fayette County, Alabama books instead of Fayette County, Georgia ones. I noticed those Alabama sources and the Moore surname. I then went back and looked at the question she was trying to answer. I couldn't figure out why she was searching in Alabama based on the info she had given, but I also knew that there were Moores in Fayette County, Alabama. I'm a little surprised she didn't find an Isaac or Nancy there. That would have been something if she'd looked in a county by accident and found her persons there! I've heard of it happening. Several years ago, a friend of mine was researching in a county where she had a lot of ancestors. She happened upon one of the more unique surnames that she knew I was researching. Her discovery helped me figure out where that family had moved. It was one of those situations where a family moved west, but then moved back east, but not quite as far back east as they'd been before they moved west. Janice shares how to know you are having a New Hampshire Christmas. In the South, we rarely have to worry about the snow boots. I love Becky's old school photos. If you are researching in Alabama, you might want to keep an eye on Alabama Genealogical Society's loose records database. 2005 Caldecott Honor book Knuffle Bunny by Mo Willems is making its debut on DVD. This might be a great purchase for the little ones on your Christmas list. You all know that I've been on a mission lately about getting folks to read more. "When students read less for pleasure throughout their lives, their overall reading achievement also declines." It appears that I'm with the majority on this one. I'm basil. I continue to follow what others are saying about Kindle. I'm also checking out how much versions of the books in which I'm interested sell for in their Kindle edition when I go to Amazon. A mass-market paperback is still cheaper for me if I get it at McKay's (used bookstore extraordinnaire in Knoxville). I think it would be a great device if I travelled more extensively than I do, but I'm not so sure that I want to spend $400 for it YET. This is almost scary. Thanks to Instapundit for pointing it out. What do corn dogs have to do with the SEC Championship? I don't normally agree with liberal blogs, but I will say that I'm concerned about the way we are overdeveloping the Great Smoky Mountains area. It seems that there are trees there one day and the next day, a bulldozer is making way for a new subdivision or new development. These posts brought back memories of a family vacation long ago. I love Rock City Gardens. I always felt Ruby Falls was kind of fake-looking. I'm glad to know I'm not the only person who likes ornaments. I discovered long ago that I didn't have room for a lot of knick-knacks from vacations, but an ornament could be stored until it's time for its display. As I hang the ornaments each year, I have a memory of the place I visited or the person who gave an ornament to me. The majority of my ornaments have a story to tell. I only have a few gold-colored ornaments to round out the tree. I wish I had some snow so I could participate in Sled Day. Books are dangerous. I just hate that I failed to the two blogs I read earlier today that mentioned cutting fingers on the pages of books. Now I can't remember which ones they were! One of the bloggers was a bookseller and said it was an occupational hazard. As a librarian, I agreed! What a great picture! I recommend that Renee gets some of these. That's where all that snow I wanted is heading!